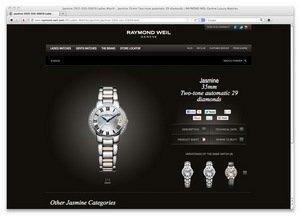 GENEVA--(Marketwire - Feb 4, 2013) - Swiss luxury watch brand RAYMOND WEIL today announced that, in honor of Facebook's 9th birthday, it has redirected all of its corporate website traffic to its Facebook page. Acknowledging the shift in consumer behavior and consumption of social media, the gesture intends to acknowledge the power of Facebook to connect brands and fans with their larger social "hives." RAYMOND WEIL will do this by throwing an unconventional Facebook birthday celebration to create greater awareness, connection and buzz. Throughout the day, RAYMOND WEIL's website traffic will be directed to the brand's Facebook page, which will share a special Happy Birthday Facebook message, providing consumers with a parallel of both companies' history since 2004. The intent of the campaign is to connect individuals interested in or shopping for the brand or watches with a new way to engage and explore with RAYMOND WEIL. Those visitors who wish to discover the Swiss Luxury watch collection or access specific information about the brand will still be one click away from the dedicated Facebook Tabs such as the Watch Finder and Store Locator. RAYMOND WEIL hopes that both its audience and Facebook will receive the well-gestured campaign with the good natured and social spirit that inspired the marketing move. According to Alain Duchêne, Head of Digital for RAYMOND WEIL: "This campaign is meant to invite our whole community to join the conversation. RAYMOND WEIL embraced social media at an early stage because we believe in proximity and different ways to connect. It is part of who we are as one of the last truly independent family-run watch brands in Switzerland. SNS and Facebook in particular have changed the way we communicate and it makes sense for a luxury brand such as RAYMOND WEIL to dialogue in a straightforward, fun and closer manner with our consumer and followers." Once the campaign is executed, the brand will review Facebook comments, actions and other points of audience feedback to measure its success. According to David Scholberg, from KBSD Digital Intelligence, the international agency based in Geneva, Switzerland: "The metrics of this campaign are indeed of interest and always a key aspect in digital marketing, but the spirit of this particular campaign is a social drive from our teams leading to an engaging and original move." The Swiss family company RAYMOND WEIL, founded in Geneva in 1976, enjoys a special place in the exclusive world of luxury watchmaking. Over the years, the Brand has come to stand out for its independent, dynamic and innovative character -- while at the same time playing an active role in the development of the local economy and international watchmaking.